I feel like this pattern does not get its fair share of love in the sewing community. For how beautiful and on trend it is right now I feel like spotlighting it. Especially as its a favorite of mine:) The Sarah Shirt is by By Hand London and one of their rare patterns that isn't a dress. This is definitely one my top three blouse patterns ever! Possibly my favorite. Followed by two totally different styles of tops, being the Cheyenne tunic by Hey June and the Hadley top by Grainline Studio. 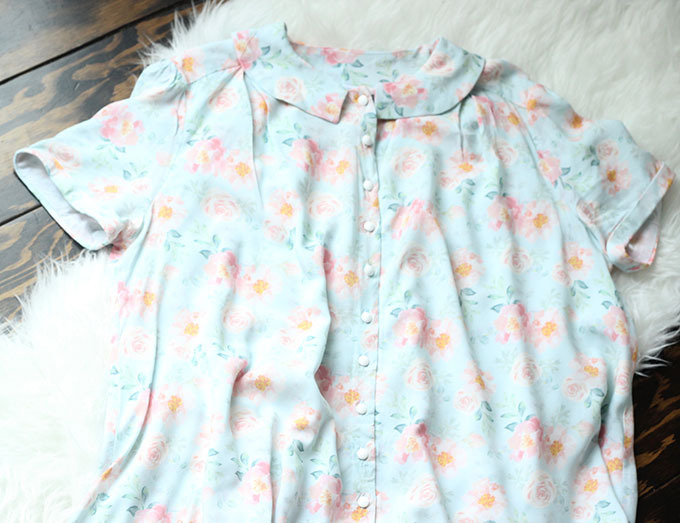 This blouse is basically a huge square with beautiful details. Is that a good enough description? Its a swingy top thats roomy, airy, but very refined with its all its special details. 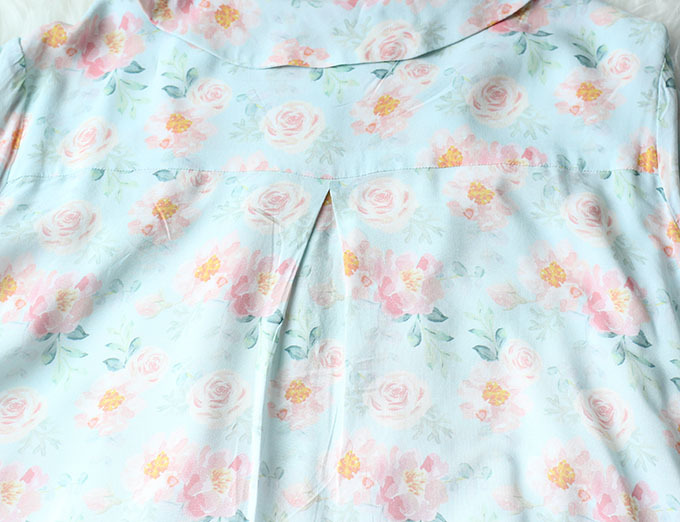 It has a back yoke with a pleat, and a pleat in the front on each side where the yoke meets the front bodice. 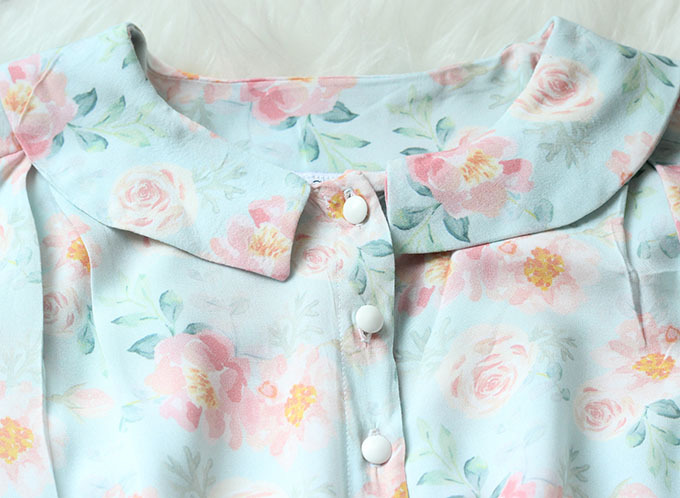 Its got two collar options, rounded or pointed (I do the pointed one) and lots of small buttons up the front. There are also two sleeve options. I've made both the long sleeve with a cuff and button and the short sleeve with a little folded cuff, seen here. There is no collar stand on this pattern so its not even that difficult to make for a button up, and there's no true button band either. It's just an extension of the bodice folded back on itself. Although I will admit that is my least favorite part of this pattern. I find a true button band much easier and less fiddly to sew and sometime I might hack this so that it does have a true one. It would be worth the time investment for me because I know I won't stop sewing this pattern for years. It works so well for my style and goes with everything. I can wear it with jeans, skirts, and shorts. Since its so roomy, (though fits perfectly in the shoulders) anything with a closer fitting silhouette on the bottom goes great with this. I have mine paired with the Pirate Pencil Skirt - which is a free pattern that surprisingly fits great with zero alterations which is unheard of for me with bottoms, even stretchy ones. This is one is made in rayon challis from Raspberry Creek Fabrics - same fabric as my McCalls 7380 shirt dress, do you believe my obsession now? 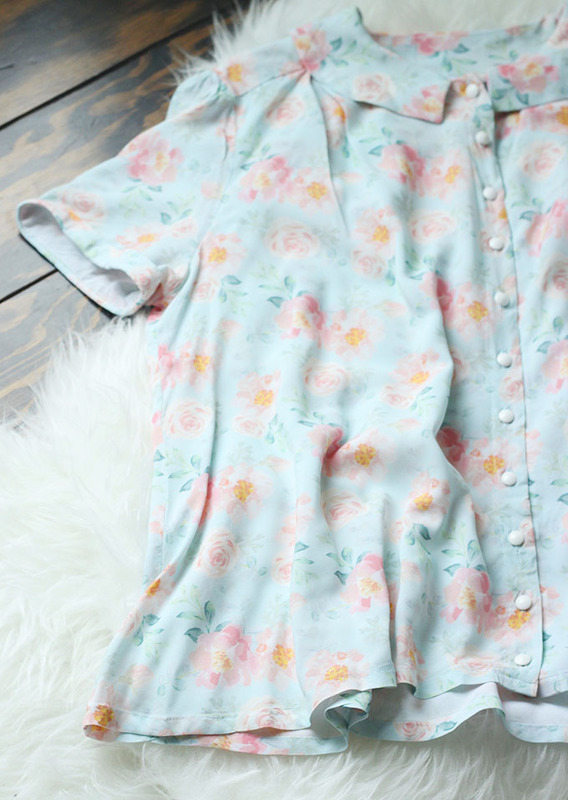 Rayon is my all time favorite fabric, but I will say I do have to iron it all the time. Definitely wrinkles pretty badly. But thats never stopped me from sewing with it. I made another in poly crepe from Blackbird Fabrics and its amazing because the extra weight behind the fabric gives it incredible drape and it doesn't wrinkle! So its basically the top I bring anytime I have to travel so there's one less thing I have to iron upon arrival. 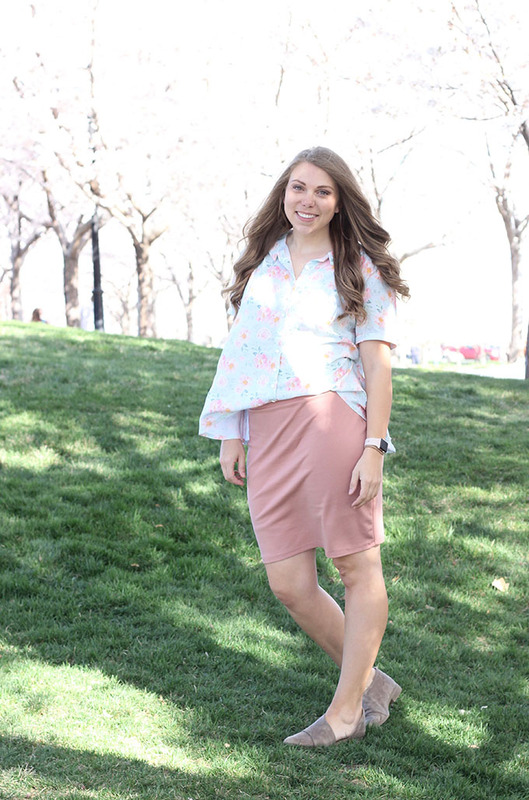 If you're on the hunt for a beautiful blouse pattern that can be worn a million ways, go with anything, and still be quite large and airy in the bodice, this is definitely one you should try!